At fourteen, Rebecca Granger falls in love with Ben Bunker. A summer girl is not allowed to love a year-round boy, son of a fisherman in Downeast Maine in 1958. Yet, she does. When her father dies—overpowered by loss and anger—she commits a sin, terrible at the time. That sin nearly destroys Rebecca. She hides in fantasies until as an adult, returning to Maine she struggles to come to terms with that past. Islands of Time is a moving story of loss, pain and growth, but also of unexpected forgiveness and love, that celebrates the people and places of Downeast Maine. In 1948, summer kid Barbara Kent Lawrence fell in love with Maine, and in 1979 she became a “year-round summer person.” She is the author of many articles and six books of nonfiction; her dissertation explored the influence of culture on aspirations in Maine. 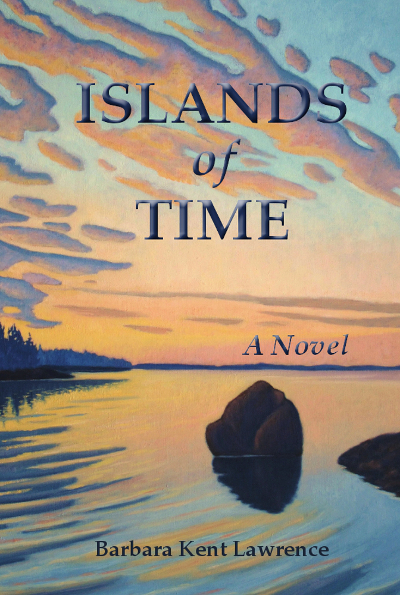 Islands of Time is her first novel, which draws on that research and her love of Maine.